Take a look at this submission from Cory. His [tag]basketball coaching tips[/tag] work well with all age groups. Try these simple tips and watch the improvements! 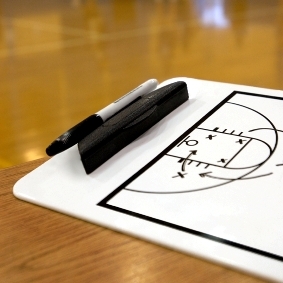 I believe in teaching [tag]basketball fundamentals[/tag] each and every day of practice. No matter what age group you work with, it is very important to work on the basic fundamentals of [tag]basketball[/tag]. I start each practice with basketball handling drills and dribbling. It’s important that not only your guards can handle the ball, but it is equally important for your big guys to handle it also. It’s amazing how many kids have a tough time not looking at the ball when they dribble. It is a little time consuming, but I firmly believe that it is very important to take the time to TEACH ball handling and [tag]basketball dribbling drills[/tag]. I alternate different [tag]basketball drills[/tag] so they are not doing the same drill every day. I find new ways of doing the same thing…which after a while the players catch on.